ABOUT: This one-of-a-kind 990 SF, 1-bedroom, 1.5 bathroom residence features west views, 10' ceilings, and 6 inch white oak plank floors throughout. The gracious living and open kitchen space allows for a seamless dining and entertaining experience. The kitchen offers a rich mix of materials and textures with custom designed solid fluted white oak cabinets, Balsatina lavastone countertops, and Zucchetti fixtures. Fully integrated, state-of-the-art Miele appliances include a 30? four-burner gas cooktop, 24 inch microwave/ speed oven, refrigerator, freezer, and dishwasher.The spacious master bedroom has floor-to-ceiling west facing windows, a large walk in closet and 5-fixture master bathroom. The bathroom features an elongated custom white oak vanity with integrated double sinks, Muse by Kos deep soaking tub, separate oversized shower, private water closet, and radiant heated floors. The powder room also features Calacatta marble slab walls and a floating custom designed white oak vanity. The residence is also complete with a Blomberg washer and dryer. ABOUT: This immaculately renovated approx. 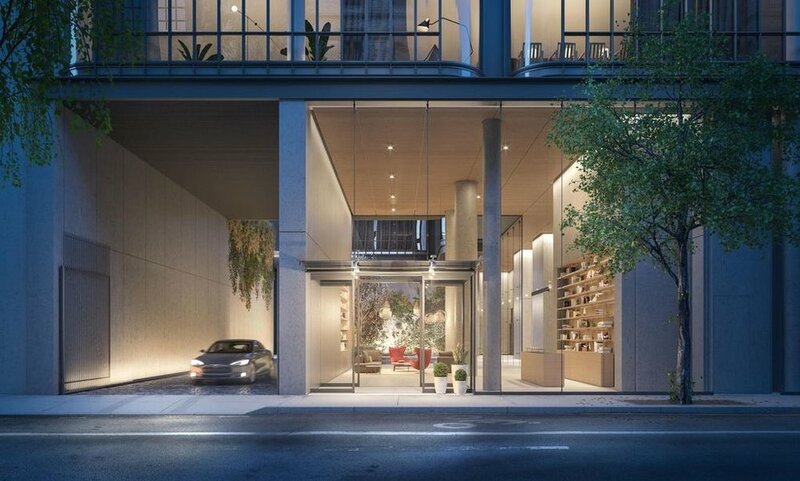 1,275 sq-ft home is located in the highly coveted Gold Coast off lower Fifth Avenue. Currently a one-bedroom, two-bath home, this grandly scaled property can easily convert to two bedrooms. Natural light streams in from six oversized windows with open sky views facing west. Well-proportioned spaces, approx. 1010 ceilings and pre-war details complete this lovely offering. The home is perfect for both formal entertaining and everyday living, with an open plan layout. The lofts kitchen is outfitted with marble countertops, Miele range, Thermador convection oven, Bosch dishwasher and Liebherr Premium Refrigerator with wine rack, flowing seamlessly into the grand living and dining areas. The home office is separated from the main living area and can easily become a second bedroom. The tranquil master suite features a large custom walk-in closet and a spacious master bath. Additional features of this newly renovated home include an additional full bath with Zuma fixtures, full-size washer/dryer, and an abundance of storage space. ABOUT: This extra-large, corner, sun-filled one-bedroom, two-bathroom with a home office, has Empire State Building views from both the living room and the master bedroom. Features include a generous entrance foyer, a sunken living room, beamed ceilings, beautiful pre-war hardwood floors and six custom closets. A lovely home for entertaining, the windowed kitchen features a Sub Zero refrigerator, deep sink, BlueStar gas stove, Viking microwave, and a windowed dining area. The master bedroom is enormous and includes an en-suite bathroom with a deep soaking Zuma tub. The guest room is perfect for an office/ den or nursery and has its own en-suite full bathroom featuring designer glass tile and Duravit fixtures. A Meile washer and dryer completes the space.